The trailer here points the way for more of what you’ll see–and afterwards, discuss at the Floyd Country Store, perhaps after sharing a pot-luck dinner staring at 6:30. Highly recommended. 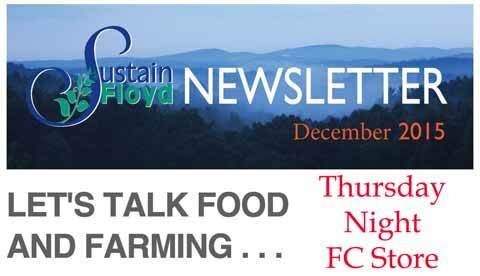 Take a look at this month’s SustainFloyd Newsletter, or skip straight to this Sustainfloyd Family Album 2 minute slide show of people, places and events in the Floyd community during 2015. Now is the time for your show of support for all that Sustainfloyd has done and is doing. What kinds of things,you might ask? Watch the slide show, then click this button to go to the DONATE form.